Chroma Atelier Traditional Mediums contain a traditional acrylic binder that tends to dry quickly and forms a tough, water-resistant skin. 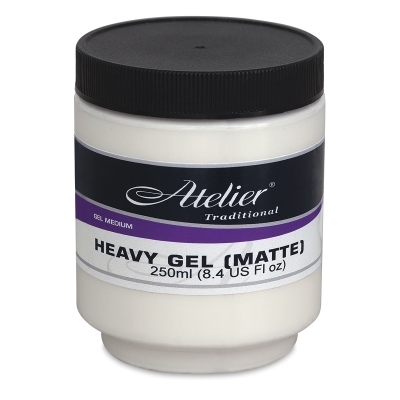 Use these acrylic mediums for traditional overpainting and layering techniques, to add texture and structure, and to extend your paints. This thick, fast-drying, waterbased acrylic gel is designed to exaggerate paint structure and sharpen textural edges. It can also be used as a very strong adhesive for bonding heavy objects. Either mix it directly with acrylic paints or apply it on top of a paint layer for transparent textural effects. It can be overpainted once dry. Choose Matte or Gloss (Gloss was formerly known as Impasto Gel). ® Chroma is a registered trademark.® Atelier is a registered trademark.